Introducing Two New Products Now Available in Our Store: The Smart Manager’s Webcourse “Creating a Credit Card on File Program” and Bob Cooper’s “Heart and Soul in the Boardroom”! 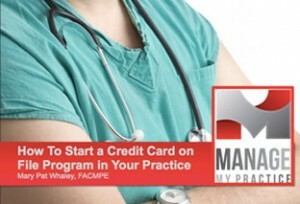 We are very excited today to announce two new products available for purchase in the Manage My Practice store! Patient Handout #2: What is a Deductible and How Does It Affect Me? We are also very excited to be adding a second book to our store: Heart and Soul in the Boardroom by Bob Cooper. We have been thrilled to reprint some of Bob’s great posts about leadership, and are now honored to sell his book. Heart and Soul in the Boardroom is a book that champions honesty, authenticity, and a management style based on a real assessment of success – both in the workplace, and in the workplace’s relationship to your life. Get Bob’s Book for $14.50 plus 2.95 shipping and handling. And if you are buying for a group (or department, or your staff!) Bob will ship them free with the purchase of three or more! Check out Bob Cooper’s Book!